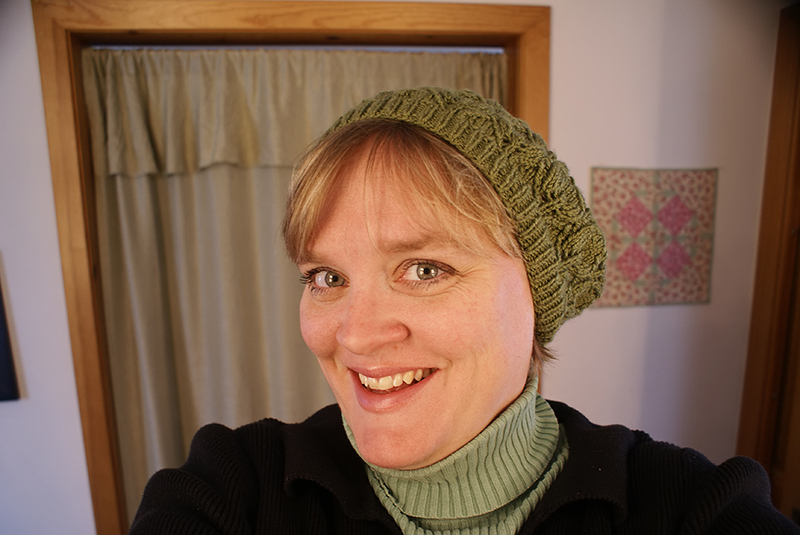 Pattern is Winter Leaf Slouchy Tam (<–Ravelry Link). Yarn is Cascade Cash Vero DK, a Merino/Cashmere/Acrylic blend. 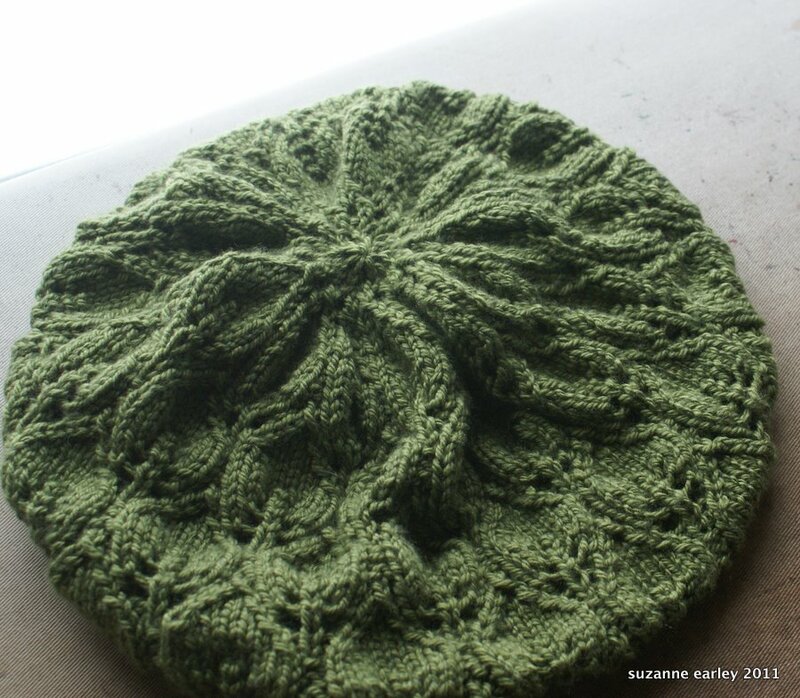 The pattern was pretty straightforward, and the yarn is so yummy to work with. There were a couple of spots where the written pattern was slightly different from the chart, but it was minor stuff and I just did what I thought was best. It is symmetrical, it was just sitting slouched funny on the ironing board. I should probably make Mark’s mittens first, though. And it sounds like I have plenty of people that would let me knit hats for them, but I’m not knitting one for my Mom. She can knit her own. 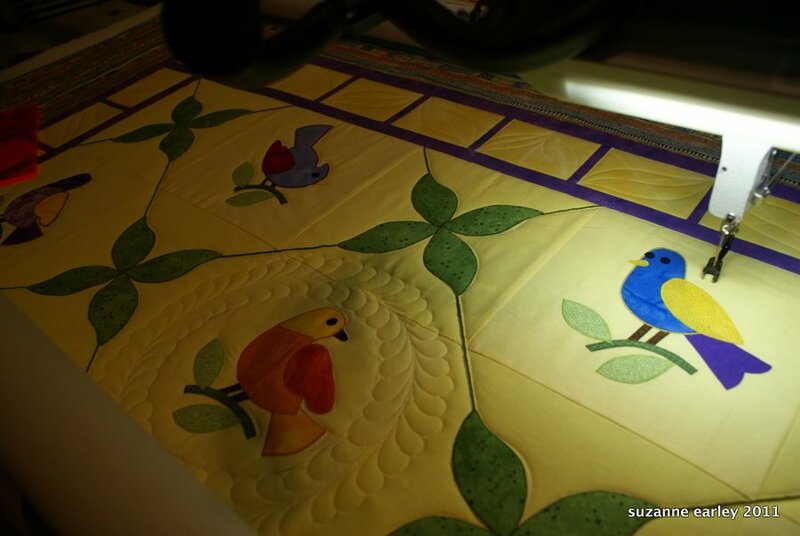 I’m working on this super-cute applique quilt today. I just discovered, though, that the bird on the right — his tail feather is missing it’s machine zigzag. Of course, I didn’t realize this until he was completely surrounded by quilting, so I’m waiting to see how my customer would like me to proceed. It needs yellow stitching, adn the back is yellow, so if it goes through all of the layers, I don’t think it will be that noticeable. I sent an e-mail — and she might read my blog, so, Linda, if you are out there — read your e-mail! That quilt is really cute but not as cute as you in your new hat! Cute hat AND quilt! It’s a great color for you!